Welcome to Residência Juvevê, a Brazilian home with flair! 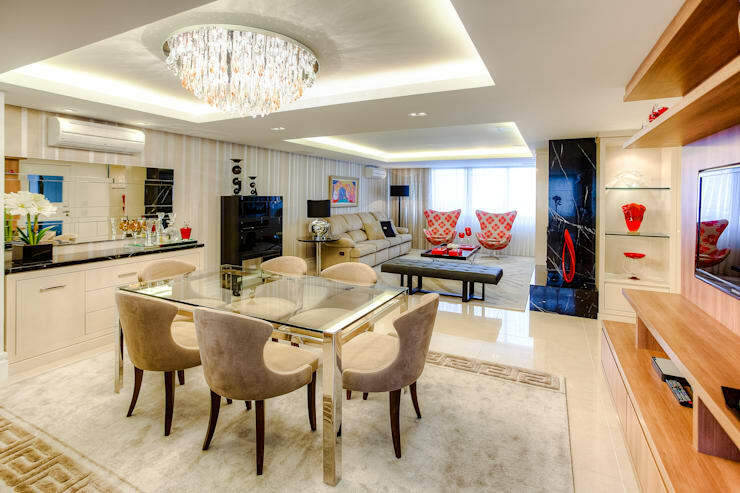 With super high-gloss red accents and mirrored walls, not to mention a panther and chandelier, this is an apartment brimming with life! The designer Vivian Lazzarotto has managed to create a home with a luxuriously spacious open plan, while also instilling the property with an undoubtedly hot-blooded sense of cosy warmth and vibrancy. Pale wooden finishes, sheer white window dressings and white walls offer a subdued backdrop for bright splashes of colour and unique ornaments. The result is a home full of personality, luxury and unabashed kitch. 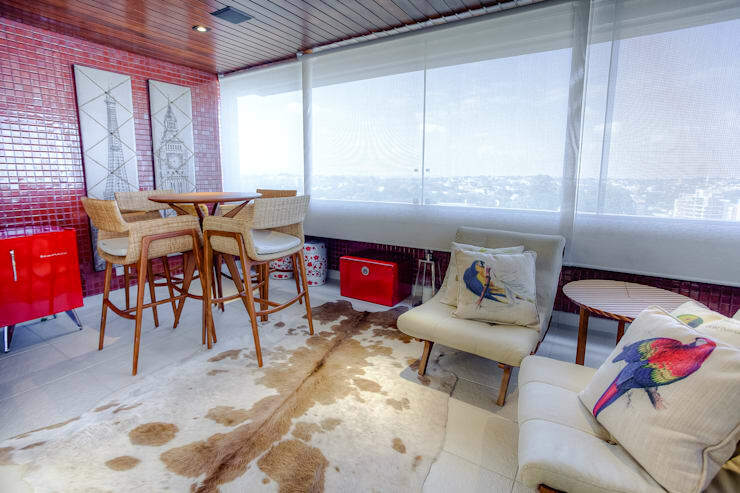 Come and explore this fabulous Brazilian home with us. You would certainly want to switch on the lights before entering this home! 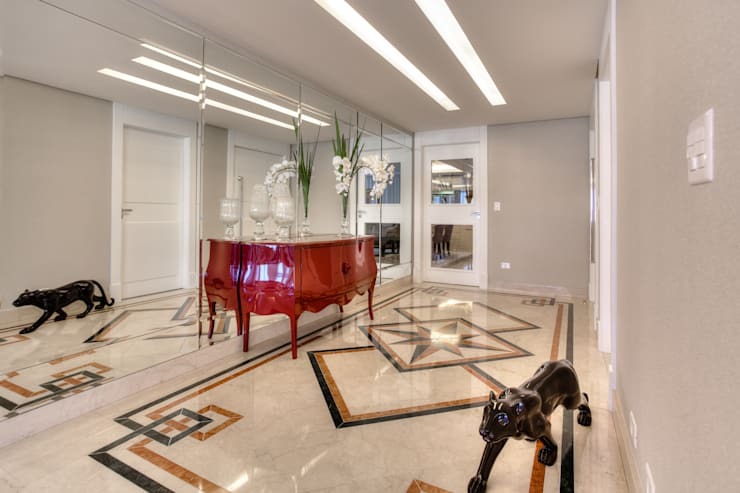 Two narrow bands of recessed lighting offer an unusual feature, a stone floor is inlaid with an Aztec design while a black panther slinks through the hallway and a super high-gloss red cabinet adds a splash of colour. To startle potential burglars even more, a wall of mirrors reflects it all. Soft furnishings and a floor covering in subtle earthy hues instill this breakfast and living zone with warmth and cosy comfort. At the same time, a wall made of red tiles and bright red cupboards inject the space with contrast and undeniable verve. To finish off the lively decor, the pattern of animal skin and motifs of tropical birds add a wild, jungle-like feel to the room. If you love colourful decor of this room, you might also want to check out The Colour Home Where More is More. A softly textured brown rug and dining chairs covered in a similar fabric create a dining zone with cosy comfort. Yet at the same time, the chairs of the table are mirrored and an opulent chandelier dripping with glossy white and gold hangs overhead. There is an undeniable glamour here, but none of this detracts from the essential comfort of this home. From this angle of the kitchen, we can see how the highly polished black kitchen bench snakes around the corner of the room. 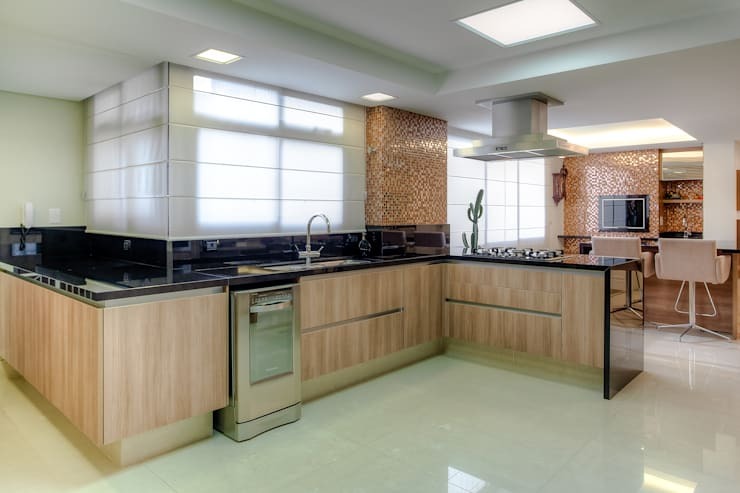 This is a kitchen layout that truly embraces the freedom of open plan living. In comparison to the rest of the apartment, the kitchen decor is relatively subdued with its pale wooden cupboards and white polished floor. But fear not, for the verve is certainly here in the background walls. Here we see panel after panel of tiny, mirrored gold tiles reflecting a glittering gold light. We love the low hanging glass pendant lights here. 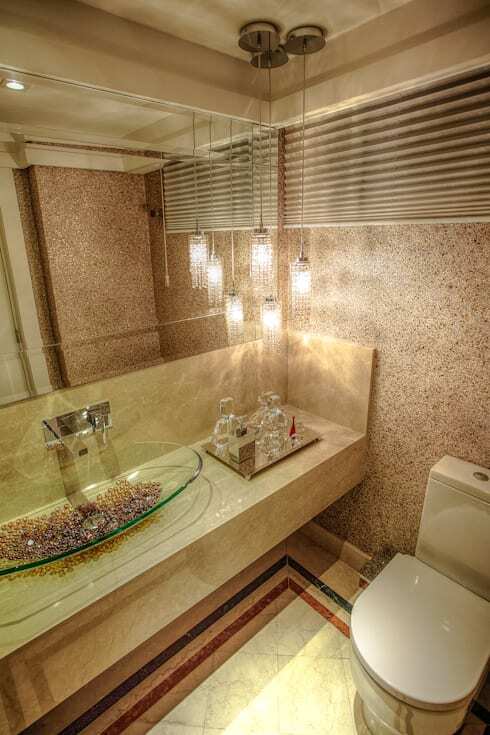 They create a little zone of luxury above the fragrances and bathe this bathroom in a warm, pink, apricot light. At the same time the marble bathroom bench, stippled stone-wall and glass washbasin offer a textured and subdued elegance. But it's the pebble feature underneath the transparent the wash-basin that's most curious. Just in case you need a little break from all this vibrancy, here's a bedroom that promises the chance to unwind in low-key style. 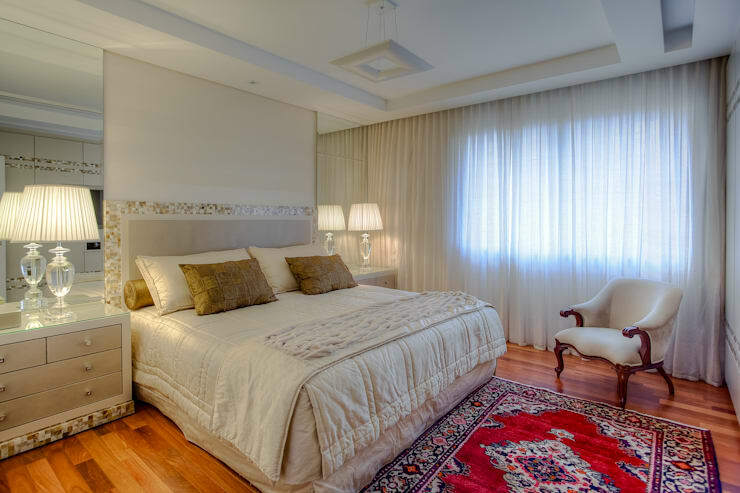 The wooden floorboards, light filtering curtains, soft chair and lush red tapestry of the carpet offer a comforting ambience. If you enjoyed this flamboyant home, you will love this Ideabook A Brilliant Brazilian Villa! What do you think of this vibrant home? We'd love to hear in the comments below!